My amazing boy who has a “pre-existing condition”– autism– has insurance thanks to the hard work, and courage of good people like John Boccieri. I will always be thankful to him, his staff and his family for all they had to put up with because of people who didn’t understand the benefit of passing this into law. Thank you! The 9-year-old was identified as Christina Taylor Greene. CNN affiliate KVOA said family members described her as “excited” about the political process, and that the desire to learn more about it had motivated her to go to the Gifford event for constituents. Christina was born on September 11, 2001, the affiliate reported. This hits close to home. 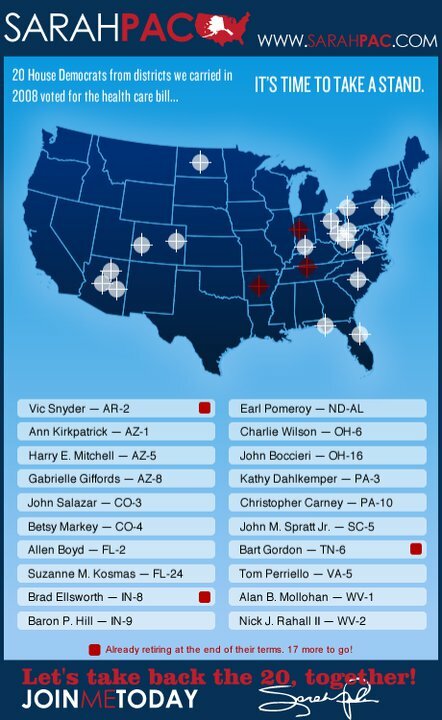 During the Healthcare debate and subsequent election, my son attended a number of events for our Congressman– who is also on Sarah Palin’s “crosshairs” list. At best Palin (Angle, Limbaugh, O’Riley, Jesse Kelly (http://www.blogforarizona.com/blog/2010/06/jesse-kelly-event-is-this-wording-intentional.html) and so many others) were childish and irresponsible… at worst, they should be prosecuted under the Fighting Words Doctrine. While we don’t know the shooter’s motives for certain or the influence of those who use reckless language on him, we do know that hate-filled, violence evoking language does result in harm… real harm… irreversible harm. It’s past time to tone it down! I’ve always encouraged my son to have an opinion– to fight (politely!) for what he needs… to be involved. I can’t ask him to do that anymore. Christina’s murder is too close to home… my heart aches for the Greene family and I know that there, but for the grace of God, goes my son… and my Congressman. Last night John Boccieri lost an election– but he is a winner! 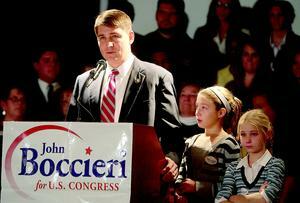 Over the course of two years, John Boccieri worked for the people he represents in Ohio’s 16th Congressional District. His courage of conviction, his prioritizing of policy over politics and his careful, thoughtful, prayerful votes have made my son’s life better. Because of Mr. Boccieri’s vote in favor of healthcare reform, it is now illegal for insurance companies to discriminate against the 1 in 70 boys diagnosed with autism. John Boccieri is a winner. Why Vote For John Boccieri? John Boccieri can tell you eloquently why you should vote for him in Ohio’s 16th District so, let me tell you why I voted for him. Boccieri gets it. He’s a fiscal conservative who voted against healthcare reform’s first version because it was financially irresponsible. He voted for the second version because it had been revised/improved so that it will save tax payers money and assures that abortions will not be Federally funded. His vote FOR healthcare reform gave my son insurance. He has autism (a previously deniable pre-existing condition) and was on Medicaid. Now, you aren’t footing the bill for my son’s healthcare– I am. In a tiny little way, my family is proof of savings to taxpayers. John Boccieri is a dad. He understands parents who want what’s best for our kids– better for our kids… He wants the same for his kids that we want for ours… and, he’s willing to do politically unpopular things to get that done. Vote today. We are responsible for electing people who represent us– not people who we tolerate because we’re mad at the other guy. Vote today. Vote for the best person, the most genuine, the one like you. I believe that’s John Boccieri and he has my vote. Tags: Boccieri, Boccieri Healthcare, Boccieri vs. Renacci, Congressman Boccieri positions, Democrat, Election, Ohio 16th Congressional District, Politics, vote, Why vote for Boccieri? Last night my little guy and I went to the final Ohio 16th Congressional debate. On Energy: Boccieri knows that green energy will provide jobs, clean the air and keep money at home. Renacci on the other hand (and the energy companies who fund his campaign) think that global warming is fiction so, he didn’t answer the question and the panel didn’t call him on it. My main take-away (since I already thought Renacci is pretty out of touch and self-serving) was that Renacci followers are rude. When J and I arrived, we saw a man putting a Renacci sign on each side of EVERY Boccieri sign along the road into the high school… during the debate, they were out-of-bounds– rude! And, towards the end, when Congressman Boccieri cited my son as an example of someone who directly benefits from healthcare reform, the Renacci supporter behind us said– “Who Cares that it helps that kid? !” Well, Rude Renacci lady, I CARE! I live in Ohio’s 16th Congressional District. I am a voter. I’ve had enough. These are the people funding Republican candidates in 2010. Mr. Renacci received $1,383,840 in funding through 6/30/10. In the organizations category,one of Renacci’s biggest funders is Freedomworks** who believes that public schools need competition from the private sector, the only thing wrong with our former healthcare system is that people sue too much and that both medicare and social security should be privatized.. energy? It’s the fault of regulation that fuel costs so much. The individual donations (anybody who gives over $250 has to disclose who they work for) have come overwhelmingly from attorneys, and those who work for healthcare and insurance companies– Renacci wants to get rid of healthcare reform and replace it with the opening of state lines and Tort Reform… WHO does that benefit?! Healthcare Reform is my favorite issue as any who have read my blog before already know. In a recent debate Congressman John Boccieri all but dared Renacci to take away the insurance card of a child with autism who was in the audience. Renacci talks about a “safety net” but refuses to define it. He refuses to say that children with developmental disabilities should be insured. He refuses to say that autism shouldn’t be a deniable pre-existing condition. Of course insurance companies don’t like healthcare reform! It forces them to be humane. In a perfect world business would do the right thing… they would forgo that third billion in profit to be compassionate… they would recognize that LIFE is a right as proclaimed by the Declaration of Independence. Then, ask yourself– WHO does Renacci speak for? We voted yesterday. 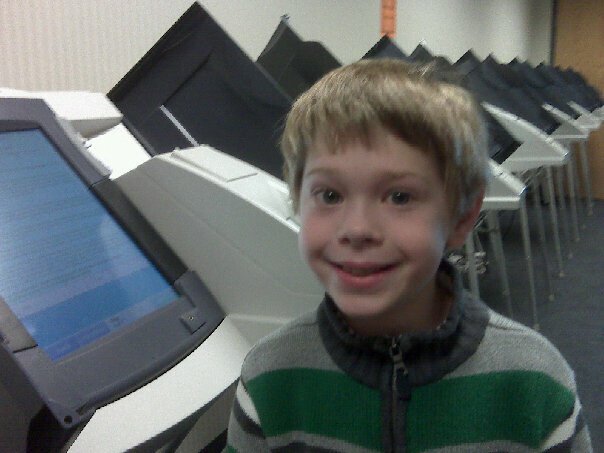 I picked my son up from school and we went together to the Board of Elections. After some great conversation with the lady at the poll, he took the e-pen and card and together we cast our vote. Since we were the only two there (besides the really nice lady) we were able to talk. Vote Early! Vote Often! Vote Boccieri! Advocacy ASD autism Barack Obama Boccieri Books Current Events Democratic Candidate Economy Education Election environment Family Fox News Grandparents Healthcare Reform Hillary Clinton John Boccieri John Edwards Mike Huckabee News Ohio Politics Politics Ron Paul Rude People Sensory Disintegration Treating Autism TV News Uncategorized What Causes Autism?